Winter can feel long and at times a little gray. That’s why we have many beautiful potted spring bulbs to help cheer you up (and cheer us up too) and add colour to these blustery white days. Here are a few of our in-store beauties! 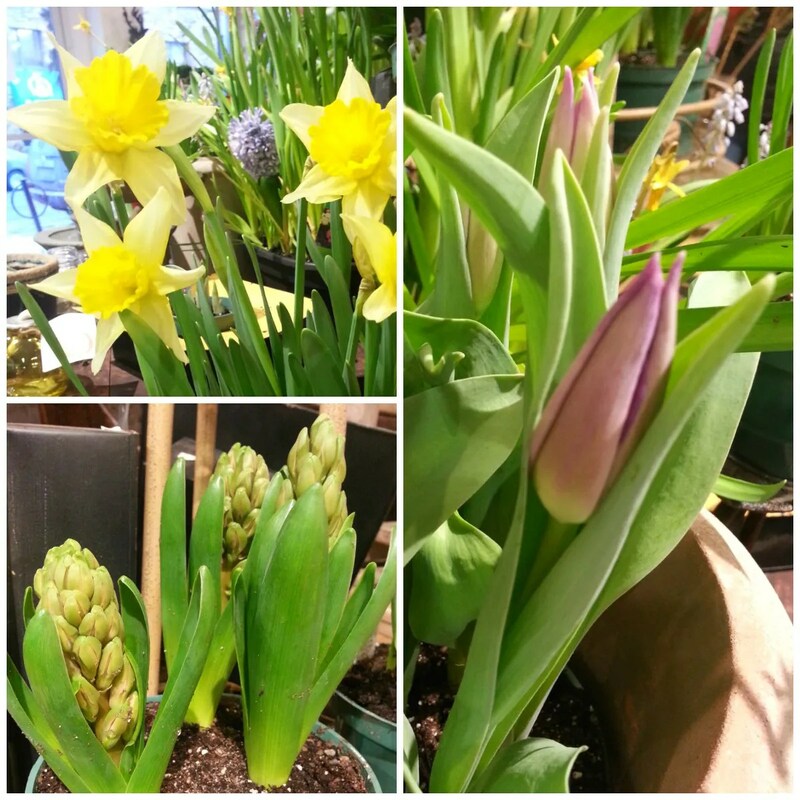 Daffodils, Muscari, and Hyacinth OH MY! 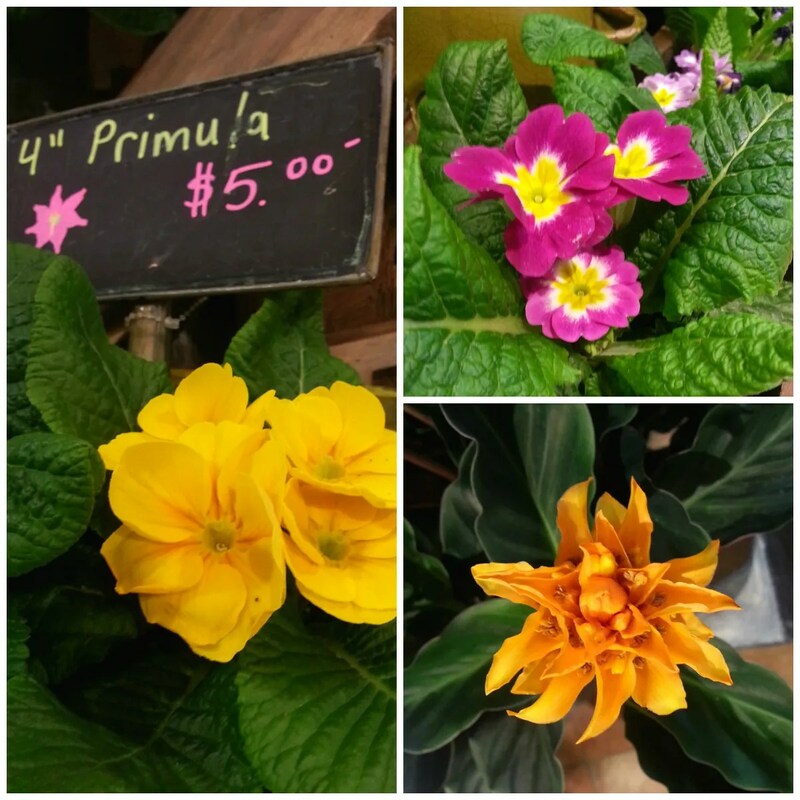 We also have some beautiful potted Tulips, Calathea and Primula to name a few more. They just didn’t fit nicely into the Wizard of Oz reference. We are able to offer you flowering bulbs at this time of year thanks to our producers who force bulbs to grow and bloom indoors in the winter. You can try this too!! But you will need to plan ahead. Bulbs need at least 12 weeks planted in earth in darkness and kept cold (but not frozen!) and then another 3-4 weeks to bloom. In total you need about 4 and a half months before you will have blooms, so mark your calendar now for when you would like to start! First you will need to plant your bulbs in clean pots using soil. No fertilizer is needed. It is best to put just one type of bulb in each pot; however, you can plant them close together (ex: 6 tulips in one 6” pot). Water them right away. Cover the pots with plastic bags and puncture a few breathing holes. Store the pots somewhere cold that stays between 2 and 8 degrees C. The fridge works well, but if there is no space in there you will need to find an unheated cellar or room of some kind that will not go below freezing in the winter. Also, if you are using a fridge, keep fruit and vegetables away from your bulbs. They produce gasses as they ripen that can damage the bulbs. If you are like me, then you will need to set your calendar to remind you when your bulbs are ready (after the 12 weeks)! Place them in a sunny but cool location in your home (not right over a heat vent). Spring flowers will last longer if you keep them cooler. They will bloom in 3 weeks at the earliest. Once they bloom you can enjoy the beautiful flowers and fragrances of your bulbs! I hope this inspires your green thumb! First i will need to plant my bulbs in clean pots using soil. No fertilizer is needed. Thanks for sharing this blog.